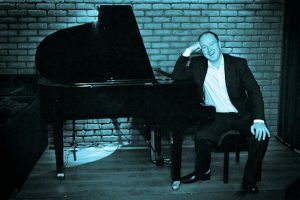 Glasgow Piano Man John Rankin is a talented pianist and vocalist. He is a versatile performer playing a wide range of material from pop to jazz . He can adapt to whatever the circumstances and give you a night of entertainment you’ll never forget. John is a fully self-contained performer who is happy to use your own piano if you have one, or will provide a digital piano and PA system if it’s needed. He has over 30 years of playing experience under his belt. He has sung for about the same length of time, and has a soulful voice that has matured over years of gigging. Whether it’s your wedding day, a landmark birthday, a corporate dinner or a relaxed house party with friends, John Rankin can offer you an evening of unforgettable entertainment. What they say about John Rankin John's performance was fantastic. Look away and you wouldn't believe you were listening to John rather than Rod Stewart!! The only shame was that he had to stop at 2am, our guests would have danced the entire night away to his live soundtrack. Roddy, Edinburgh, July 2012 We were fortunate enough to hear John playing a few months before our wedding in Spain and were so delighted when he agreed to come over and play for us during our big day. John was absolutely tremendous – playing all the songs we had asked for in advance and every single request from all our guests! We can never thank him enough for making our wedding such an amazing day.